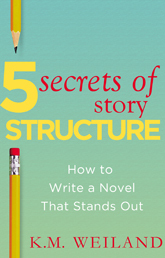 Discover the “secrets” of story structure other authors are overlooking! If you’ve read all the books on story structure and concluded there has to be more to it than just three acts and a couple of plot points, then you’re absolutely right! It’s time to notch up your writing education from “basic” to “black belt.” Internationally-published author K.M. Weiland shares five “secret” techniques of advanced story structure. By the time you’ve finished this quick read, you’ll know more about story structure than the vast majority of aspiring authors will ever know—and you’ll be ready to write an amazing novel that stands above the crowd. Take the next step in your evolution as a writer! "It's amazing. I learned so much, including that I instinctually built my story on a bit of structure." "Really helped me get a handle on my plot."